The first stop on our recent river cruise was to Kinderdijk, Netherlands. Kinderdijk is located in a polder at the the meeting of the Lek and Noord rivers. After docking, we headed to the Mill Network at Kinderdijk-Elshout. 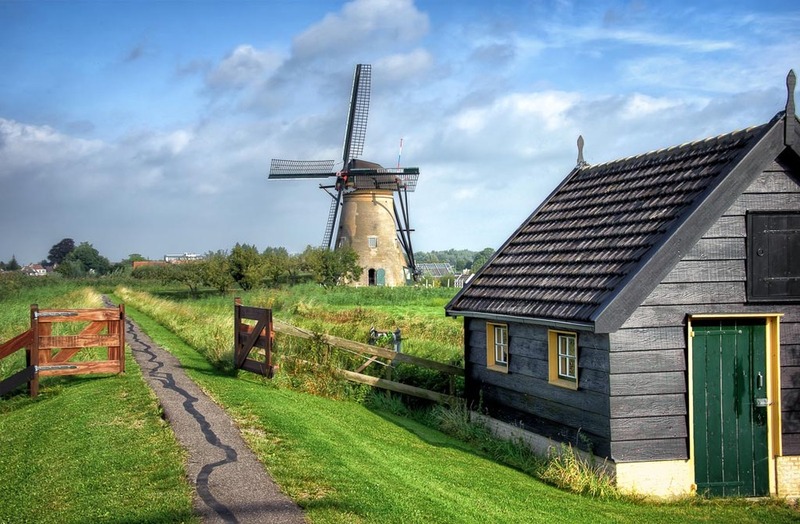 This attraction is a UNESCO World Heritage Site and consists of 19 windmills that were built around 1740. The reason these windmills were built was to reclaim the land from the water thus creating the polder. Before visiting the Netherlands, I hadn't realized that 27% of its land mass is below sea level and how much land has been reclaimed from the sea. It seems amazing to me that about 250 years ago, someone came up with the idea of building these windmills to reclaim land. This is an image of one of the windmills at the the Mill Network. The river is to the right of this windmill and I was standing in front of another windmill. I really liked this composition as it shows some of the reclaimed land.